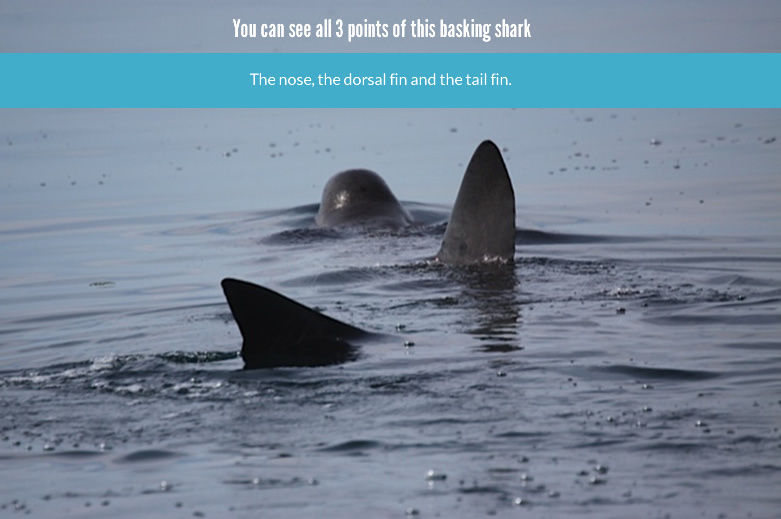 To take a basking shark passport we need very good quality information. 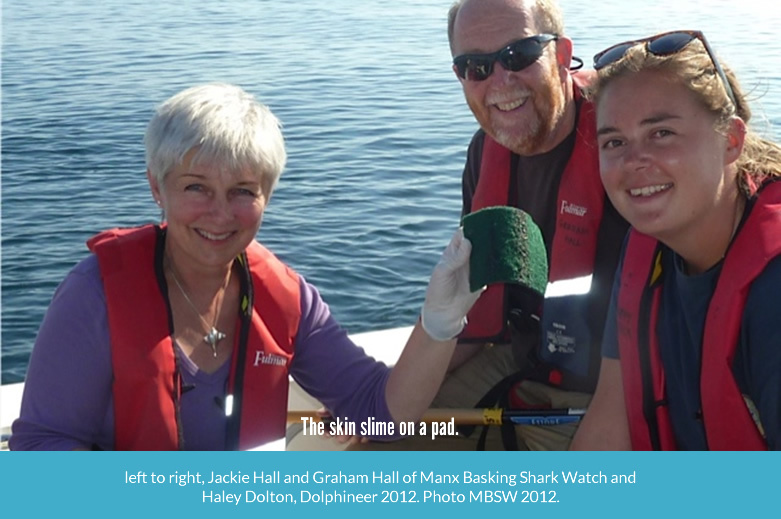 If we have it we can identify the shark again and again, every time it comes back to Manx waters. 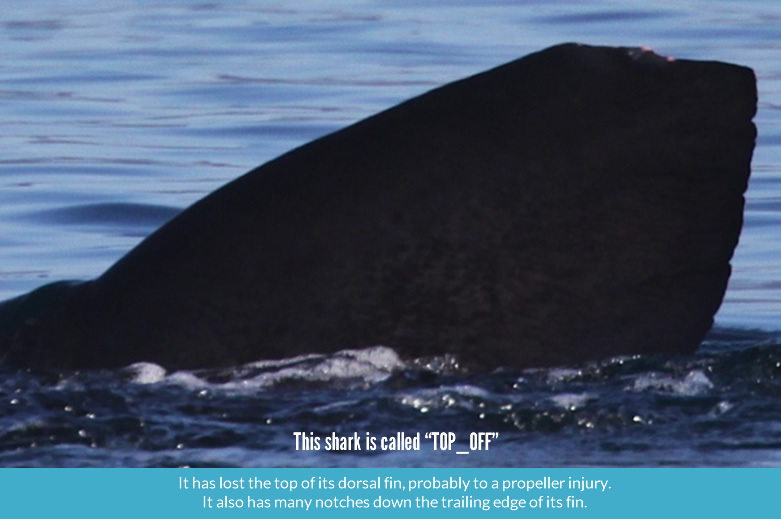 If it goes elsewhere scientists will be able to identify it just by looking at its dorsal fin pictures. 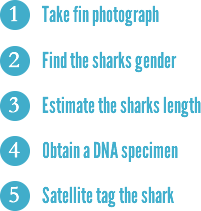 We could even identify it after its death by looking at its DNA of find out how closely related it is to other basking sharks by looking at its DNA profile. We always do it in the same order to a very strict protocol that is licensed by the Manx Government's Department of Environment, (DEFA). The main steps are listed below and in more detail in the section underneath. First we take high definition photographs of the left and right dorsal fin. 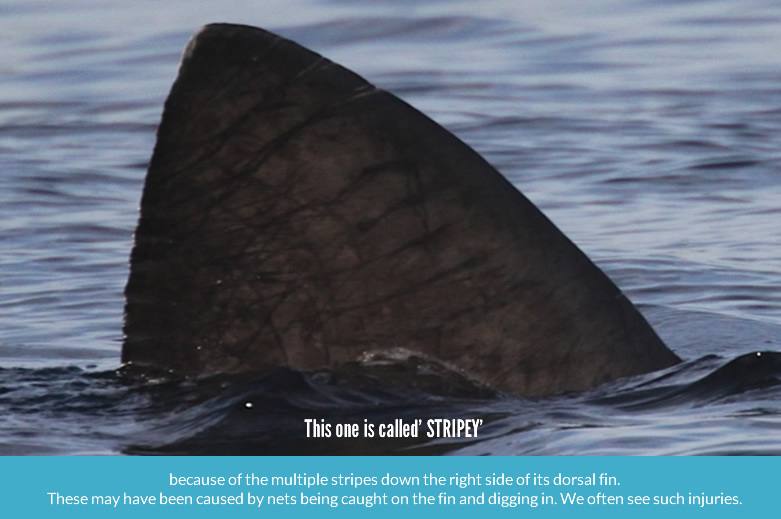 This means that we can ID this animal again just by looking at the distinctive notches and marks on the fin. Here are a few examples of the dorsal fin photographs from the MBSW fin catalogue. 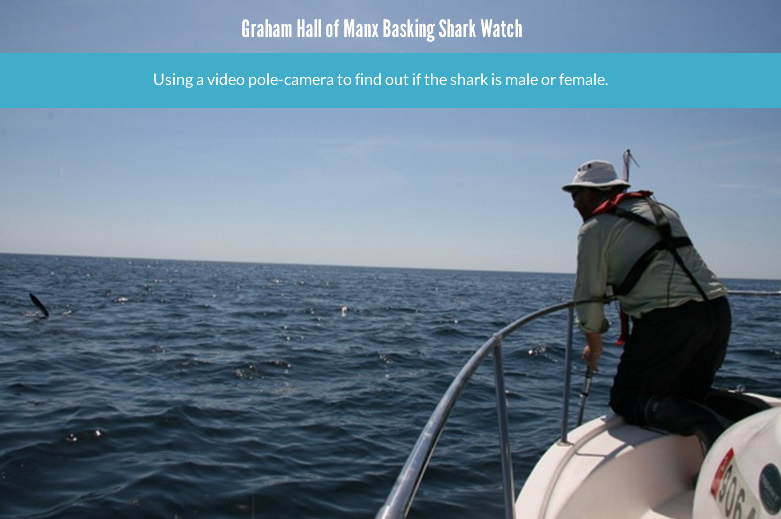 Next we find out the sharks gender: We put a pole-camera into the water on a very long pole into the water under the shark. We look at the sharks genitalia to see if it is a male or a female. Sometimes we find out other things from the pole camera. 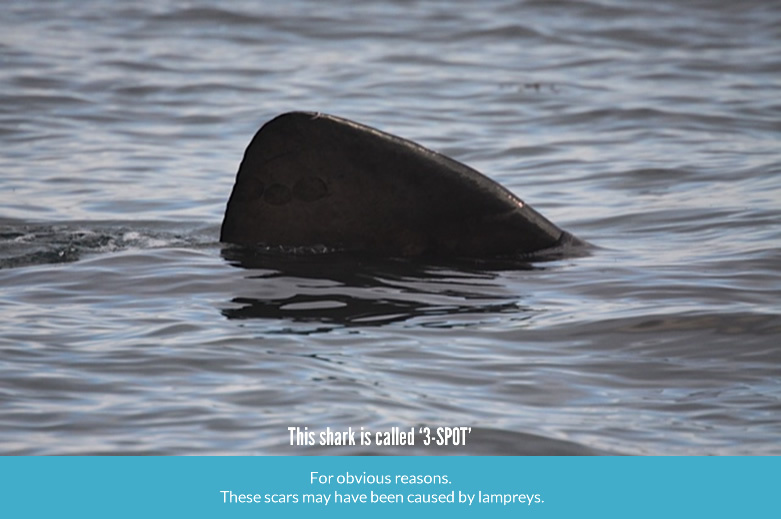 We may see that a shark is tagged or we may see rub-marks from courtship or injuries from boat propellers. Next we estimate the length of the shark: At the same time that the shark is alongside our 6m long boat for gendering we estimate the length of the shark relative to the boat. it is VERY hard to do this as the sharks have a very bendy cartilaginous skeleton. One minute you may estimate the shark’s length at 4m and then a moment later the body and all three points have stretched out and you realise that you are looking at an 8m shark. This shark is feeding right at the surface because it is a very hot day and the plankton, its food, has gathered at the surface. You can see that the water has an oily, bubbly appearance, it is bubbling with life. Photo: Jackie Hall 2012. 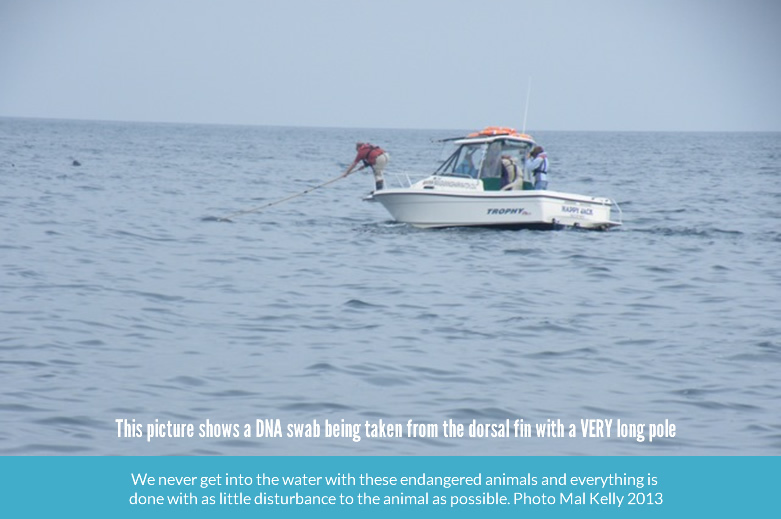 The next close approach is to swab the slimy skin on the coral fin to obtain a skin swab for DNA. 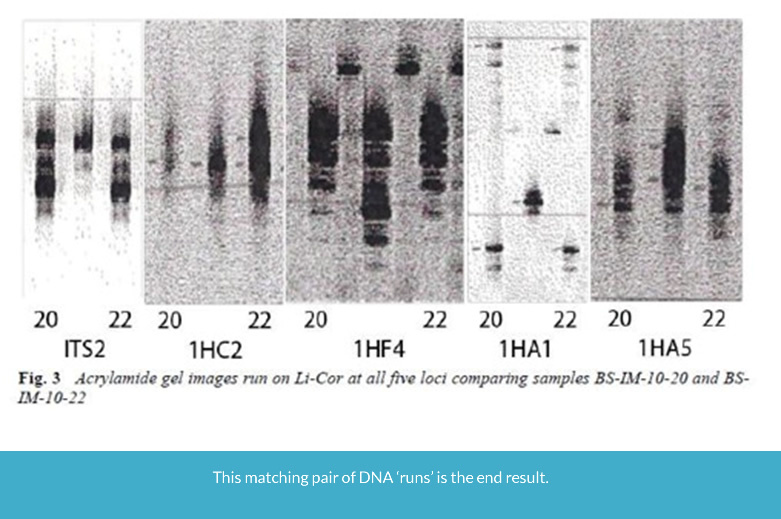 This works in exactly the same way as taking a DNA swab from the inside of a humans cheek. It does not harm the shark. See a video of ‘Fricassonce’ having his DNA swab taken. If we are lucky enough to have a satellite tag we may put one on the shark at this final stage. 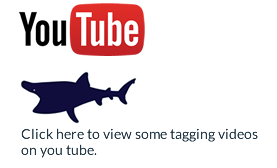 We have tagged 21 sharks like this thanks to the great generosity of various firms, most notably Tower Insurance of Douglas and Celton Manx. if you would like to sponsor a tag please contact us via this website. 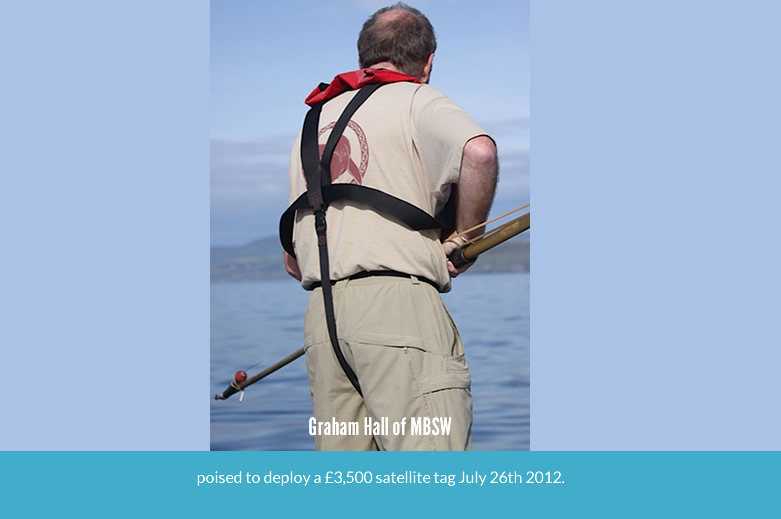 Graham Hall of MBSW The tag was generously sponsored by Tower Insurance of Douglas and placed upon a large male shark, ‘Eric the Goliath’. We also tagged him in 2011. See a video of ‘Fricassonce’ being tagged.